Very fast gluten free dessert. By Nicky. And Jamie. Having gluten free mates over for a meal can be challenging. I mean it’s hard enough to organise a menu, cook AND keep the house in some sort of vague order, let alone research and understand gluten free options. I don’t like feeling like I am a burden to my mates when they are faced with what to feed me. For the first year of my new Coeliac life, I didn’t really speak up much about it, as I didn’t want to seem needy or picky. Which is actually a bit selfish, as people go to lots of trouble to cook for you. And often I’d just plain forget, until a few minutes before arriving at a dinner. Other than being not very cool, you also end up being quite hungry. I still find coming up with simple gluten free dessert ideas to be a challenge. As do my mates. So this recipe is a good one to have up your sleeves. It’s easy, fast and tastes unreal (thanks Jamie for the execution, and Nicky for the brains). A dodgy iPhone shot – and it still looks great. Meringue shells (packet job). One or two each – depending on hunger and sweet-tooth levels. Fresh berries – strawbs, raspberries & blueberries are all good. Get the meringue shell. Fill it with yoghurt. Cover with berries (artistically). Add chockie (if using). Get back to your conversation. Previous postChicken schnitzel with spaghetti - man grommet food. Next postMother's Day breakfast - the report. Thanks for makiing me Rockstar famous Ness. It only took 2 minutes to make but the thought and research was long (despite the Low flying Chook like Creature website). This desert is best served with a sticky white and not the 12 year old Shiraz we had. it was like eating a steak with icecream. OK got that sorted out….! unfortunately for you horris – your friends are more inclined to believe your missus … looks v nice Nic!! YUM! 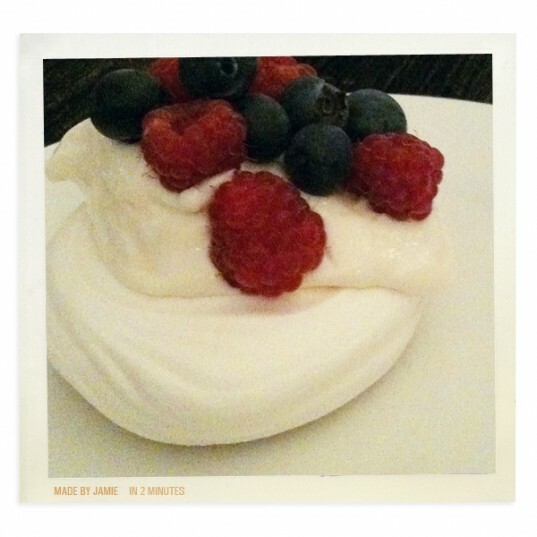 I have made this with marscapone and it never fails to impress. Can also mix up the toppings for variety.